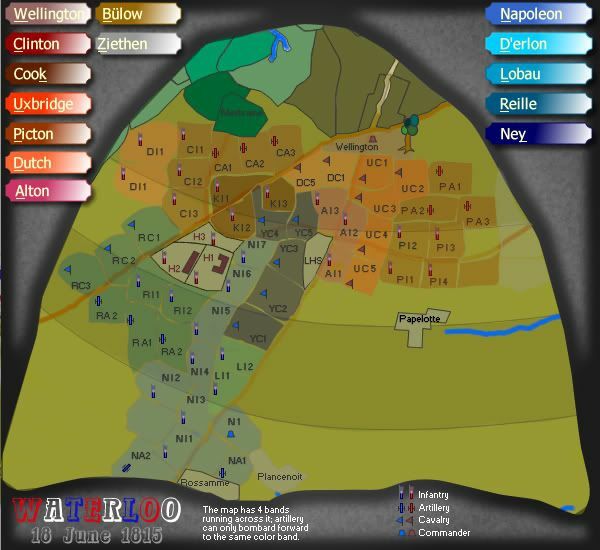 How Should Napoleon's Waterloo map be represented? In Dec 2013, the map was reworked in Photoshop 5 from it's original Fireworks Version. There has been some call for a while for someone to do the Napoleoonic wars in some form or another. 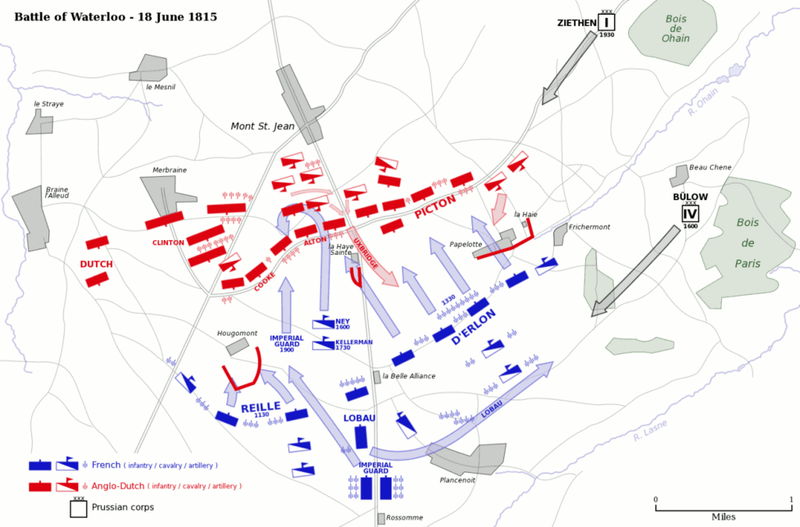 Below is a battle map that i want to use, but because of the complications of this battle, and the fact that it was staged over several hours on this day June 18, I want to know from the Foundry how this map should best be dramatised. Therefore the poll above has been devised to determine some direction for this map. Last edited by cairnswk on Wed Jan 08, 2014 1:22 pm, edited 50 times in total. It would be perfect if this was quench on June 15, preferably 2015. There's an obvious battle line going down the center, but I still prefer the classic map style. I vote B. I'm not a good enough player to use the attack line strategy to help me - it usually gets me killed. Regardless - good luck Cairns. I'm sure your graphics will be outstanding. Thanks Gnome...I hope this one works well. unriggable wrote: It would be perfect if this was quench on June 15, preferably 2015. He he ha ha! For an Anniversary that would be great....but i think players want this as an addition to the site long long time before then. ^ you know you want to add this!! Peons are pawns or underlings used for whatever purposes suit their master/commander (in this case the commander is a field marshal). I was one of the few who voted to use the battle lines like Pearl Harbor. I realize we are in a renaissance of sorts - with the boon in map production (especially, non-traditional ones), but I don't feel this would be as good once converted to a traditional map. Indeed Aerial Attack. I was hoping for such an outcome as your suggested battle lines. The flavour of this attack sequences is very much lost on the normal traditional style of map, however, i am attempting to produce it so it doesn't loose that "force". If you're going to use it, can you rotate the map so it's a more simple north to south affair (wellington and napoleon respectively). is it possible to code mobile bombardment points? Given it's a small scale map, I'd consider introducing another layer of complexity and reality. This was standard tactics in the firearms era and produced collossal casualties when executed correctly. There are other possiblities I could suggest, but this would be one of the easier ones to implement. The1exile wrote: is it possible to code mobile bombardment points? But Artillery should definitely bombard stuff... and I think the Cavalry should be able to attack say two "territories" ahead... and Infantry one or something!! sangfroid wrote: Given it's a small scale map, I'd consider introducing another layer of complexity and reality. I had started working on this in the direction below, but i think this is crap? do we get bonus points if we agree it is crap? onbekende wrote: do we get bonus points if we agree it is crap? Below is the how i had started previously laying out the battle scene in line with the standard RISK style play. According to the poll above, there is a call for different shapes to represent the three forces....so i will have to adapt this below. I dunno Cairns, some of you maps look like a technicolor Rorschach test...a little too cerebral and not enough of a hook for me... but this will be an interesting development. mibi wrote: I dunno Cairns, some of you maps look like a technicolor Rorschach test...a little too cerebral and not enough of a hook for me... but this will be an interesting development. perhaps I can say the same of your Supermax colour scheme. For anyone interested this is an excellent article on Mibi's reference to the Rorschach test. Even I had to look it up. I'd like to hear the day Mibi, when you actually have something pleasant to say about my maps, even something encouraging; and not aimed at judgement but rather a contribution. Meh -> Mibi's managed to rattle the normally serene Cairns!!!! hey cairns - version 3's looking better than the first, but why the explorer helmet inlay(thingy), maybe keep it as an open playing field? your probably already on the way to this - but giving the map a clear wellington-napoleon oppositional gameplay would be best? hopefully will have a feel similar to pearl harbour, which is a beautiful map. yeti_c wrote: Meh -> Mibi's managed to rattle the normally serene Cairns!!!! He's not the first yeti_c....----i had that honour way back when...now back to the map please. Last edited by AndyDufresne on Wed Apr 23, 2008 11:30 pm, edited 1 time in total. asl80 wrote: hey cairns - version 3's looking better than the first, but why the explorer helmet inlay(thingy), maybe keep it as an open playing field?